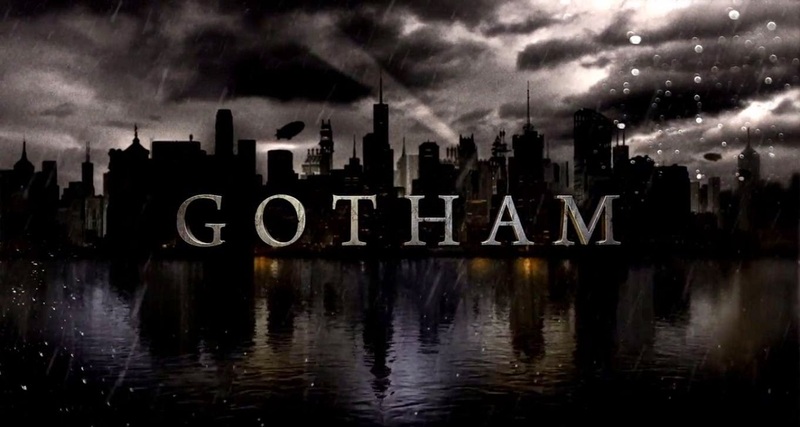 Gotham just aired its pilot episode on Fox last Monday. This new TV series is among this fall's most anticipated TV show and a promising one. Gotham is a new TV series from Fox whose plot is sort of a prequel to Batman story. The series revolves around James Gordon on his early days as a detective in Gotham City Police District and his first encounter with Bruce Wayne when he tried to solve the high-profile murder case of Thomas and Martha Wayne. The episode open's with the murder of Thomas and Martha wayne in front of their own son, Bruce. Another girl, Selina Kyle witness the crime as she tried to leave the dark alley. Afterwards, new detective James Gordon (Ben Mckenzie) and his partner Harvey Bullock (Donal Logue) is assigned to handle the case. Bullock initially does not want the case but when he felt insulted by the MCU detectives Montoya and Allen, he decided to handle it. Running out of suspects with evidence such as the gun used not on the police database, Bullock seeks assistance with mob leader Fish Mooney. Afterwards they were able to aprehend a suspect, Mario Pepper, but killed him in the process when the latter tried resisting arrest. Further investigation found on Pepper's home revealed a pearl necklace that is apparently owned by Martha Wayne. The murder case is now declared solved by the police. James Gordon grew suspicious upon finding out that their initial suspect might not be the real killer and possibly set-up by Fish Mooney. Almost getting killed by Mooney, Carmine Falcone saves them from death and discovers the depth of corruption inside Gotham Police District (GCPD). To find out who was really behind the Wayne murders, he will have to get inside the mafia. To prove his worth, he has to kill Oswald Cobblepot who betrayed Mooney to the police. Before faking Oswald's death, he informed Gordon that a war is coming with Falcone's enemies. Gordon then visits Bruce to inform him of the truth that Pepper was framed and asks him to keep it a secret until he can find the real killer. He has now formed an unlikely friendship with the young boy that will one day become the Batman. This is one of the TV series that I was able to start watching right after it was released and I am looking forward to follow this show this year. It is included in my list of TV series/shows to watch for 2014 together with Marvel's Agents of Shield, Arrow and Flash. The pilot was able to capture the event that marks the origin why Bruce Wayne had to become the Batman. I believe that the series will show how Gotham was before there was Batman. As shown in this episode, Gordon was able to see how deep the corruption in government and the police department is and he must join the bandwagon to achieve the goals he wanted. Selina Kyle (Camren Bicondova) - The first character to be shown in the episode. Her future persona reflects in being a pickpocket and affinity for cats. She gets no dialogue over this episode but just an observer of what happened. She is also a witness to the murder of Thomas and Martha Wayne. Harvey Bullock - He plays partner to James Gordon. He seems to know a low whats going on the mob world since he is friends with Fish Mooney. By the end of episode we are able to determine that he is working for Carmine Falcone since he told James Gordon to kill Oswald to make sure "he is with the program" or in short with them in the mob. There is some goodness in him since he asked James to request for transfer since he is a good guy and Gotham is not a place for people like him. James Gordon - The main character whom the TV series plot will be revolving. New detective assigned to GCPD. Made friends with Bruce Wayne and his guardian Alfred Pennyworth and promised the young Wayne that he will get the real culprit behind the murder. His father was previously a District Attorney that worked with Carmine Falcone or as he claimed. Bruce Wayne (David Mazouz) - Young boy who witnessed his parents murdered by a masked man. Alfred Pennyworth (Sean Pertwee) - He becomes the guardian of Bruce Wayne after his parents' death. In this series, his accent when talking to James clearly shows his British lineage. A lot can be discovered to this character's origin with this series. Hopefully we will know more about him in the coming episodes. Renee Montoya (Victoria Cartagena)- Detective from GCPD Major Crimes Unit (MCU). In the comics, Montoya became the second person to take the mantle of the superhero Question. I am not sure if character will be coming up on this series. Crispus Allen (Andrew Stewart-Jones) - Montoya's detective partner. Detectives from MCU seems not part of the system. I think this 2 detectives are part of the good guys and not corrupted by the system or the mob. They would like to take the case but Bullock was insulted and kept the case. In the comics, he became the incarnation of Spectre after being killed in action. Sarah Essen (Zabryna Guevara) - Captain of Gotham City Police District. Only appeared once and had little dialogue. I hope we learn more about her in the next episodes. In the comics, she was once Gordon's partner and they even had an affair. 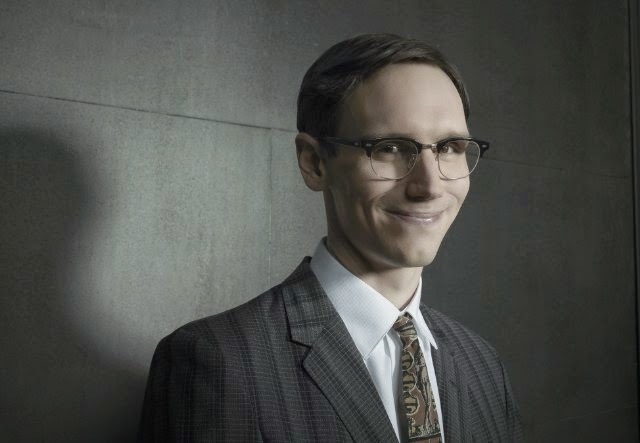 Edward Nygma (Cory Michael Smith) - He is a coroner in GCPD who always likes to talk in riddles. Bullock despises him when he tries to do some riddle when presenting an evidence. He's a bit surprised when Gordon was able to catch up one of his riddle "What's nowhere but everywhere except where something is?" which is nothing. I think I'm going to watch and wait for his riddles he will be delivering in the series and make a list of it. Fish Mooney (Jada Pinkett-Smith) - New character created for the series. She is a mob boss in Gotham working for Carmine Falcone. She wants to take over control of the mob from Falcone and she will do anything if she'll have the opportunity to do so. I am not sure if there's a possibility that she's one of the good guys because this is way to early to tell. 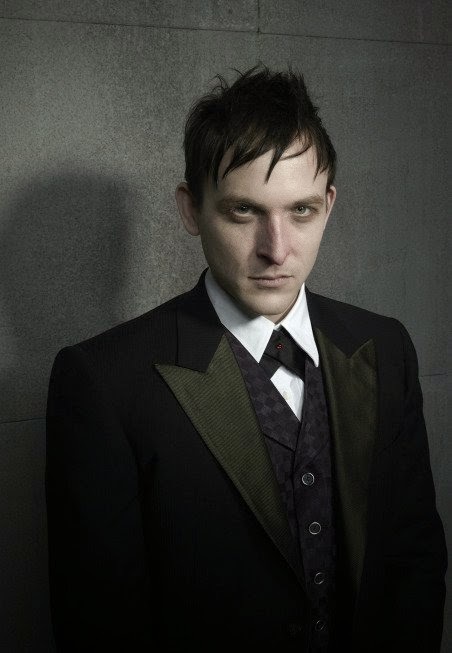 Oswald Cobblepot (Robin Lord Taylor) - One of Fish Mooney's underlings. He does not want to be called the Penguin. During this episode, he was shown holding an umbrella for Fish - which foreshadows his signature tool. He is shown to enjoy pleasure when inflicting pain to others. Although unacknowledged, he seems to know a lot of what's going on with the mob. Being near to Mooney, he's able to tell if there's a conflict arising within the organization. The cause of his limp walk is due to the beating he received from her when she discovered he betrayed her. I wonder if he'll have a comeback on the next episode after Gordon "killed" him. Barbara Kean (Erin Richards) - James Gordon's fiancee. She owns an art gallery. In the comics, Barbara was married to James Gordon and later divorced. She personally knows Renee Montoya. Ivy Pepper - Mario Pepper's daughter. She seems possibly physically abused by her father. During some of the scene, she was shown near the potted plants, which clearly identify this character as Poison Ivy. The writers clearly stated that she's based on Pamela Isley alter-ego but did not yet if she will be Pamela Isley during the course of the show. Carmine Falcone (John Doman) - Leader of a Gotham City Mafia. Saves Gordon and Bullock from Mooney's men killing them. He claims that James' father worked with him during his time as DA. He might be saying it to have James in his side. A lot of speculation circled over the net that the standup comedian doing a gag for Fish Mooney is the Joker but the writers clarified that these are just teaser for the Joker character. There will be other Joker references to be shown in future episodes. Will Oswald be back by next episode? This might complicate things for Gordon's standing within the mob. What's the deal between Renee Montoya and Barbara Kean? How do they know each other? It seems that Gordon is unaware of their past? Does James Gordon's father really worked together with Carmine Falcone during his time as a District Attorney? Or Falcone is just messing up Gordon's mind so that he'll have Gordon at his side? Are we going to see super-powered villains here or just a reflection of their persona before becoming the villains Batman will face in the future?